I think I was psychically channeling Petit Vour about this month’s picks. Two of the items are things that I had really been wanting. To be more specific, in the week before I got this box, I noted aloud that I wanted two of these (nonspecific to the brand) things. One week later, those things were on my doorstep. Thank you, Petit Vour for tuning in to our little subconscious cosmic exchange! Juice Beauty Stem Cellular CC Cream – I’m almost through a tube of Pacifica’s BB cream. 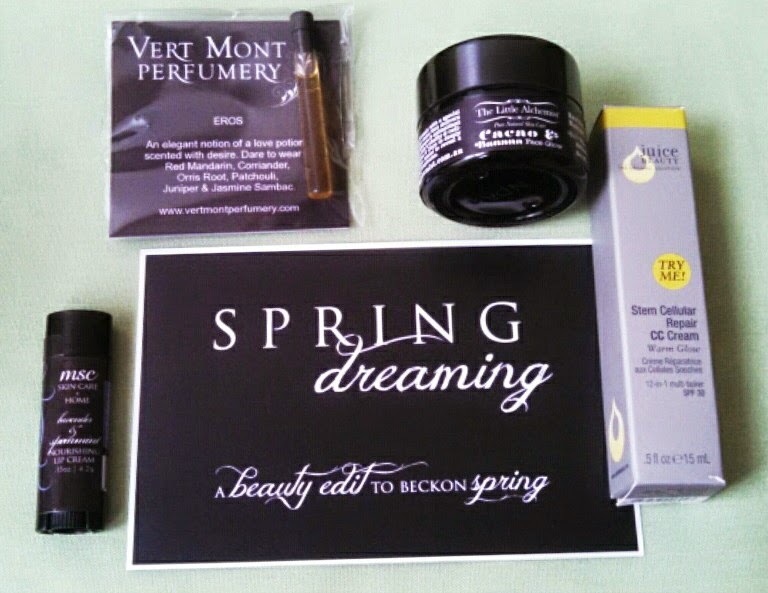 It’s the only BB cream I ever tried, and I thought, “I wonder if Petit Vour will ever do a CC or BB cream in their box?” Lo and behold, there is a CC cream in the March box! I really love that it has a nontoxic SPF in it. It’s a very natural-looking light coverage, subtle glow, and it’s claims of cellular repair are enticing. Vert Mont Perfumery Eros perfume – Another product I’m almost finished with is a custom essential oil blend that a friend made for me. The main oil in it is red mandarin which has quickly made it’s way into my top 5 favorite essential oils. I’m sad that I’m almost finished with it, so imagine my excitement when I saw this perfume in my box with red mandarin as its first ingredient! It makes me smell like an woodland hippie love goddess in the best way possible. It’s complex, sensual, and grounding. It’s unique to any other perfume I have, and I really like it a lot. I’m considering purchasing their sample pack so I can get acquainted with the rest of their perfume line. The Little Alchemist Cacao & Banana Face Glow. A face mask with clay, adaptogenic herbs, and superfoods = happy skin. The ingredient list looks like some kind of supplement-boosted smoothie I’d drink: banana, goji, maca, cordyceps, spirulina, ashwagandha, turmeric, and more. My skin was very soft and looked so radiant after using this! I love that it comes in a glass jar that I can reuse once I finish the sample. Oh, and the rest of their products look just as amazing as this one. Can I try them all?! Metropolis Soap Co. lavender spearmint lip cream – Pittsburgh has still been blustery and cold for many days, so my chapped lips have welcomed any help they could get. This lip cream nourishes my lips really well. The only thing I didn’t care for was the scent. I realized that while I like lavender, I don’t care much for it on my lips. I’ve been using it, but it’s not my favorite. They also have lip creams with anise or lime with spearmint which sound nice. More Vegan Cheeses Come to Pittsburgh! “a woodland hippie love goddess in the best way possible”- love that! Hi, neighbor! I love Philly; I wish I lived closer, so I could go all the time. 🙂 Glad you love the description! It's such a beautiful scent.